Start your dog training with place command teaching, which is an easy instruction to train your dog to go to a place and to control its excitement. Place: The command to “place” is performed on an elevated area, such as a dog cot, a bed, a park bench or even a stairway. The elevation is key, so there is a clear and defined boundary which assists them to stay. The “place” command is ideal for having a dog maintain manners and not beg. If you use something movable, like a bed, you can teach them to place in different areas. For timid or skittish dogs, the “place” command can often be a confidence booster. The reason is that dogs are uncertain where they should be or what they should do and this gives them a clear idea of what’s expected of them, and they can experience a sense of success. Of the thousands of dogs I’ve trained, every one of them has learned to love “place” as it is a game or challenge for them. 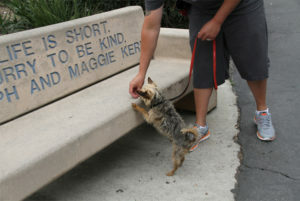 An example is when I walk my dog, he wants to “place” on a park bench or large boulder. They associate this with a reward, and the elevation brings a feeling of empowerment. With the dog on a buckle collar and leash, have food three to four inches from the nose and guide the dog to the place where you want it to stay. I am happy with sniffing or even one foot on it, and give a reward. Then we walk out in a circle and come back for another attempt. 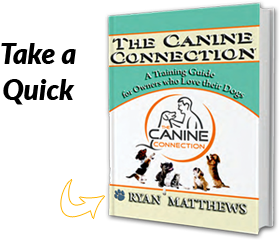 Myself Ryan Matthews, the Orange County’s dog training tips provider as I get a few successful responses, I demand more each consecutive time. If the dog gives me two paws, the next time around I will expect three or four paws on the place, for the upcoming attempt. Place: Getting the canine comfortable with touching the new “place,” encouraging with food, while having a leash to assist if the dog freezes. The free shaping method requires more handler attentiveness than luring. With free shaping, I don’t use a leash, but want the dog to learn to find the answers on its own. An example of something I promote with free shaping would be the dog’s investigation of the place. If it sniffs, I will click and reward. Whenever you free shape a new behavior, you want to use the clicker method to identify what you are wanting. One of the most common issues, as a dog trainer, I observe when teaching the “place” command is when a dog freezes. To progress past or through that, what the handler needs to do is 1) change up the environment, 2) change your approach, which could mean just changing the side of your approach, and 3) if the dog freezes, take a step; your motion creates motion in the dog. Place advanced: Use your imagination on what you can get your dog to “place” on. 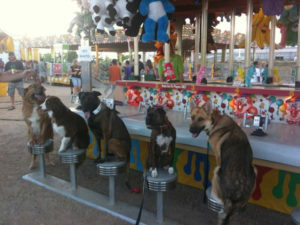 This was one of our most fun group classes; yes it really is at a fair!